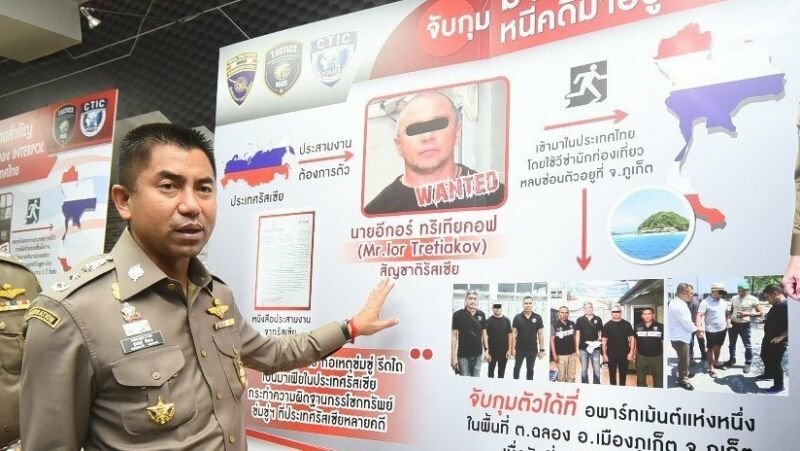 PHUKET: A Russian fugitive wanted in his home country for extortion has been arrested by Thai police in Phuket. Immigration Chief Maj Gen Surachate Hakparn announced the arrest to press yesterday (Mar 22). The fugitive, Igor Tretiakov, was arrested at his rented apartment in Chalong last Tuesday (Mar 19), Gen Surachate said. “This man is wanted by Russian authorities for intimidation and extortion. He is a dangerous person"
Another waste of plastic with the signboards. Any chance of BJ declaring war on plastic waste in Thailand? He could have Thailand drop from #6 in the world table of plastic polluters of the ocean down to around #150 by lunchtime, given the claims about everything else he's done. so the Russians have no problem using Interpol. Because they can buy there way in.. The only time Thailand catches up with them is after a tip off ! Off topic posts have been removed. I'm surprised he wasn't spotted before now seeing as he appears to be going around wearing a black mask over his eyes.